It is undeniable that the healthcare industry is changing at a rapid pace, but what are the effects on the ambulatory market? 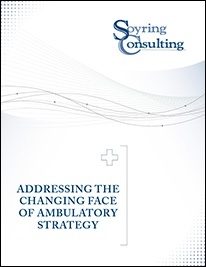 What factors should you consider with regard to ambulatory planning? What considerations for staffing and operations must you make in your strategy? What barriers exist to your proposed strategy and vision in the changing marketplace? Soyring Consulting provides clinical, managerial, and strategic consulting services to healthcare facilities of all sizes, including For-profit, Not-for-profit, Community, University, and Faith-based facilities and systems. We have provided master planning assistance for new and existing facilities in all departments/areas. Our team has worked in more than 40 states across the United States in all areas, including surgical services, sterile processing, hospital and facility design, nursing/clinical units, and others. By combining our experience, proven knowledge, and time-tested skills, we work with your team to create targeted opportunities, along with the plan and achievable goals to reach them.